Jonathon defeats 20 Philistines privately in a remote field – the event witnessed only by his armour bearer. David, in the epic, underdog battle of the millennium publically slays a hulking, veteran warrior before the watching eyes of two armies. If the Israelite army was giving out awards at the yearend banquet, we could say that Jonathan’s name had just been engraved on the MVP trophy but before it’s put back in the case, it’s sent out for new engraving. With many of us having some experience with envy and insecurity, we wouldn’t have blamed Jonathan if he launched his own covert campaign to remain in the limelight – to make sure it was his face featured again on the magazine covers. There they stand. The dust of battle settling. The Crown Prince of Israel and the Shepherd Boy. Jonathan had ample human reason to fortify his elevated status and keep the young hot shot in his place. But that’s not what he does. Over the last two weeks of study, we’ve already seen that Jonathan moved with Intentionality toward David and Committed himself in friendship. But it gets even better. Jonathan is evidently moved by the discrepancy of the picture before him: This valiant character, disguised beneath the attire of his blue-collar job. Jonathan could have sent him to the armory tent for some standard issue. But instead, so great was his concern for David’s rightful honour that Jonathan personally ensured it with no regard for his own image. He strips himself of the clothing and equipment that signify his elevated status to clothe his friend in the uniform of a prince and warrior. Instead of being indifferent to his elevated status. Or secretly enjoying how far above David he was positionally. Or keeping a respectable distance so that David wouldn’t forget who he was, Jonathan does what he can to elevate his friend. From this gesture we learn that an extraordinary friend does NOT COMPETE. I fear that some of us get more satisfaction from making others envy or revere us, than we do by building them up and bridging any perceived chasm that might exists in their mind. Though we wouldn’t actually voice it, we value the stroking of our own ego over the good of those we call friends. I can say that, because I’ve been guilty. I am sad to say that in my pride and selfishness; at times it felt good to me that people thought I had it all together. It secretly delighted me that women thought I was on a higher plane than they were. Oh, I certainly wasn’t. I knew that, and anyone who knows me well would have known that. But I let some women entertain that faulty notion without correcting them. The truth we have to face is that we can never love a friend and be in competition with her. Living a lifestyle where my elevation comes before your good is incompatible with loving because it requires that I keep you lower than me. Now I’m not saying that this requires we shrink back from excellence in life or that we never engage in friendly competition. (Like who can still cross the monkey bars or who can jump on the trampoline the longest without requiring a wardrobe change.) But some of us are guilty of taking that too far, and in a quest for personal preeminence, we simply must be the best at everything, all the time. Not only is that tiring. It’s simply not good for our friends. Am I slow to praise or compliment my friend because I feel that I’m admitting her superiority? Am I bothered when others praise my friend but overlook something noteworthy I have done? Am I bothered when my friend copies my good idea (decorating, parenting, recipes) for fear that she will get the credit and I won’t? 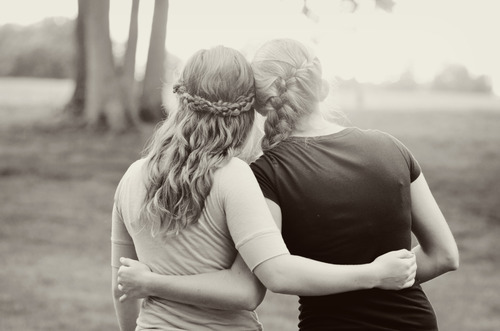 Do I have an easier time grieving with a friend in her sorrow than I do celebrating with her over a wonderful increase or blessing in her life? Do I cast doubt on the motives behind her good works because it makes me feel better to bring her down a few notches? Am I bothered when my friend is the center of attention, prompting me to “one-up” her story, accomplishment or news and redirect the focus to myself? Even if I could benefit from her wisdom, do I refuse to seek my friend’s advice on a matter because I can’t bring myself to admit that she knows something I don’t? Am I holding back from pursuing a friendship with a woman whose excellent character challenges me? So friend, what’s the verdict? Comrade or Competitor? As you may have experienced, the common friendship is easily sabotaged by selfish cravings for individual supremacy. But if we desire our friendships to move beyond the realm of common, let’s ask for God’s strength to be an extraordinary friend that does not compete but instead esteems and elevates those we say we love. I feel guilty. I think it’s cuz I’m guilty. Well said. What can we say? We share the same perfect feet, the same refined sense of humour, and the same besetting issues… Love you! Your desire in choosing to be my comrade and not my competitor has made our 20 years of marriage very sweet – Thanks! Do you mean that footrace that you lost? I have found in friendships, the more “human” I admit I am, the more approachable I am and thus people feel comfortable around me. I like to bring comfort. So I don’t struggle often in friendships with the issues above but you know where I do? In Church. I FINALLY became Born Again this past year and I’ll tell you… having a dark, sinful past and walking into Churches filled with “good” people was the most intimidating thing ever. Christians were too good for me and I was too bad for them. I still feel this way now and then but I fight it with common sense and God’s Word. I’ve known for years that no one has it all together, that those who appear to have great lives have areas of turmoil, etc., etc. But when it comes to being a Christian, I’ll admit… I still feel less than on many the occasion. Especially around folks who grew up Christian and radiate light. I don’t lie about things though, oh no. I just don’t let myself become truly known by other Christians but a few! However, it occurs to me that to glorify God, and for people to see what He can do with a wounded heart and a damaged soul (and hopefully be inspired or comforted), I must be honest about who I was, am, and want to become through the steadfast, enduring love of our Lord. One day. One day shame, ego and fear will be replaced with… well… God. Hey Tracy – Thanks for your transparency! The truth is, us “good” people who’ve grown up in the church are acutely aware of our sin & shortcomings – it may not be as obvious but it is just as ugly. Seeing folks walk in who God has plucked from a pit is the most refreshing and encouraging thing in the world! And the darkness of the past only emphasizes the light. Truly. So glad to have met a new comrade! Well said Janet. So so true.